The new Suzi Q utilizes the new 27+ standard. 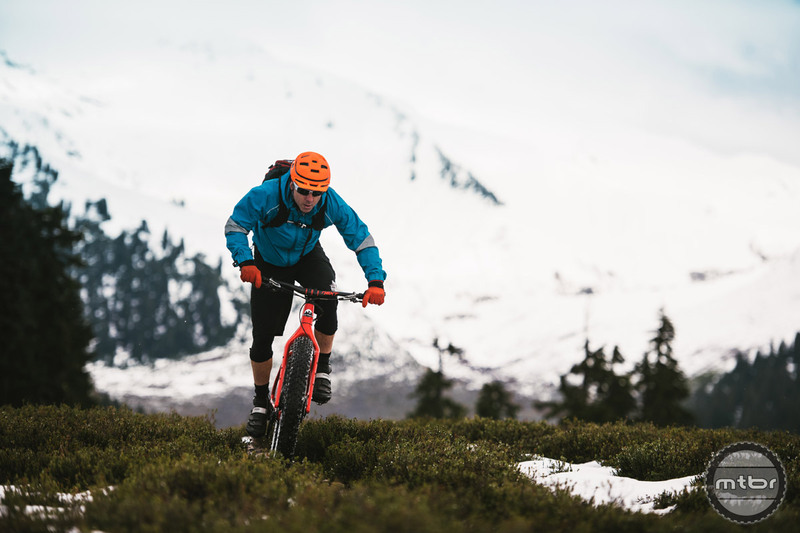 The wheel size offers fat bike levels of traction while being more efficient and well-rounded. 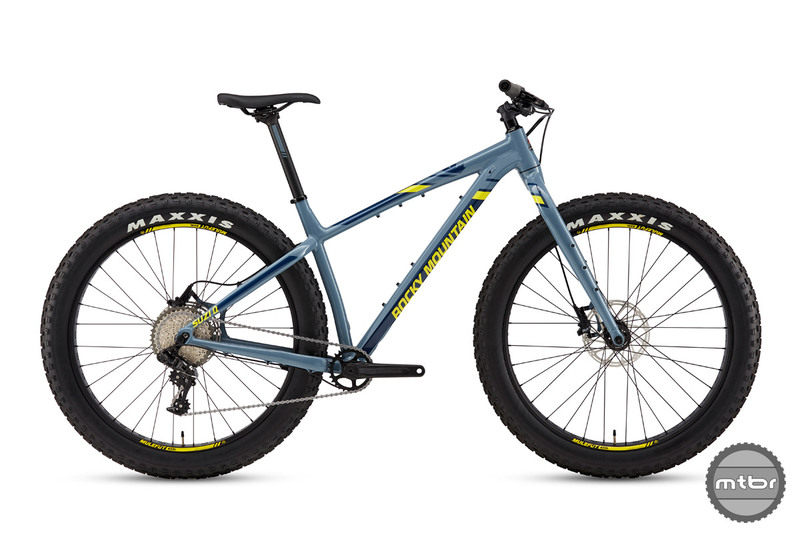 While the rest of the mountain bike world abandoned 26” wheels years ago, fat bikes continue to roll on the smaller wheel size. 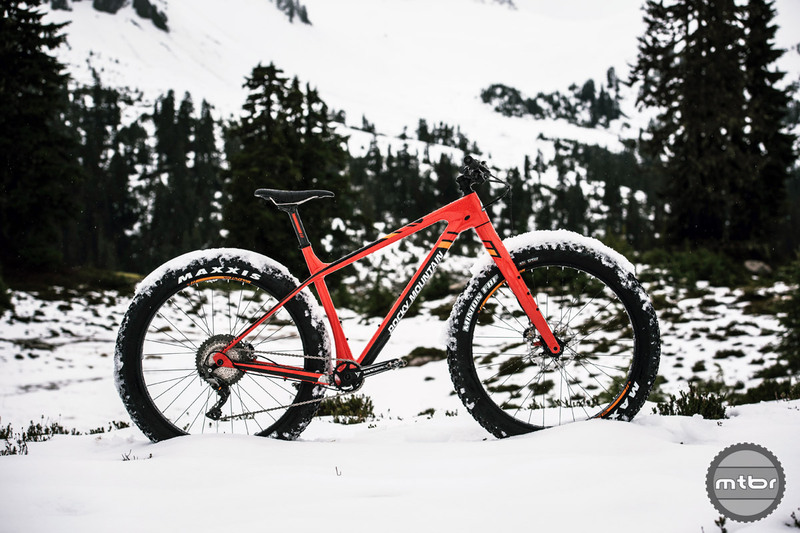 Equipped with oversized tires, these bikes are a blast in the snow and sand, but handling is sluggish elsewhere. For riders with a cross country background or those looking for a more versatile performance, the burgeoning 27.5+ standard may offer a better experience. 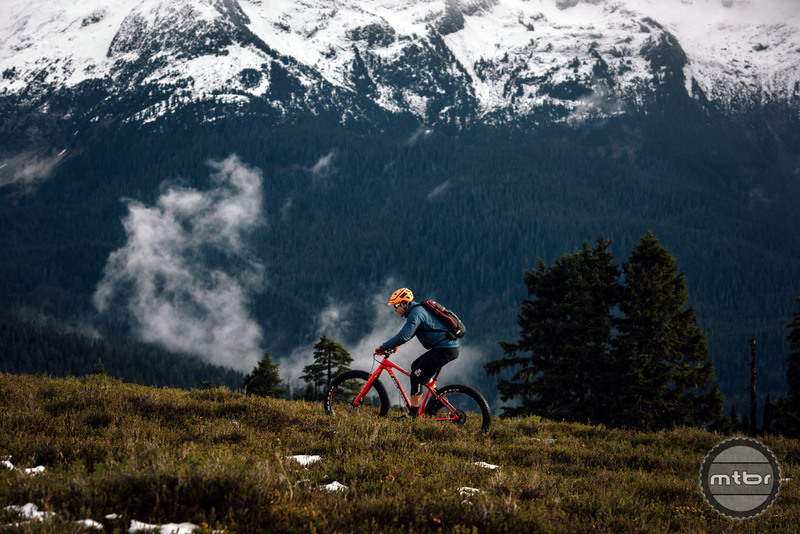 The larger diameter wheels paired with high volume 3.8” tires provide similar benefits to standard plus set-ups (traction, low pressure, improved rollover), while also adding more go fast to the fat bike mix. The narrower q-factor and faster wheels make the Suzi Q more versatile than traditional fat bikes. The new Suzi Q from Rocky Mountain follows this formula. It comes stock with 27.5×3.8” tires but can clear up to a 4.2” rubber. Since the stays don’t have to clear the massive 5” tires you’ll find on some fat bikes, Rocky was able to perform a nip tuck on the q-factor. 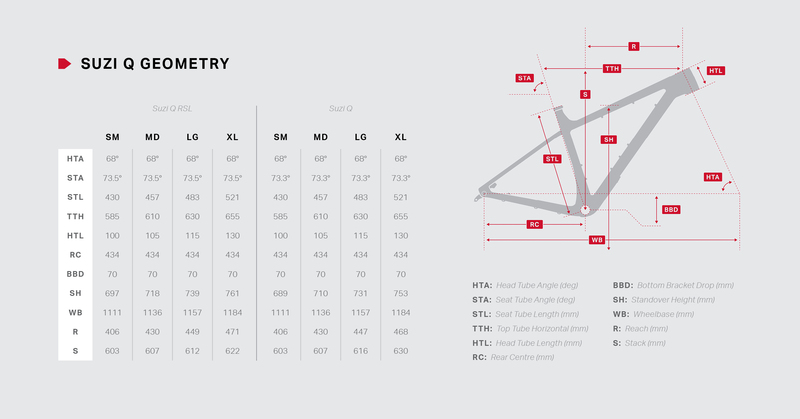 The 192mm width is about 20mm narrower than standard fat rigs, which helps improves pedaling efficiency and comfort. The Suzie Q is compatible with a suspension fork. A 100mm travel RockShox Bluto set at 20% sag delivers the same geometry as the stock rigid fork. The geometry, according to Rocky Mountain, offers a “stable and balanced ride that still feels agile thanks to super short chainstays and a lengthened reach.” It’s hard to comment without riding the bike, but the 68-degree head angle, longish top tube, and 17” (434mm) chainstays likely deliver lively handling characteristics. There are mounting options for up to four water bottle cages. Two on the fork and two more in the front triangle. Other finishing details include Di2 compatibility, 1x specific, internal and stealth cable routing, and Rivnuts for bolt-on frame bags. The base level Suzi Q retails for $1,900. The Suzie Q ships in S/M/L/XL frame sizes. 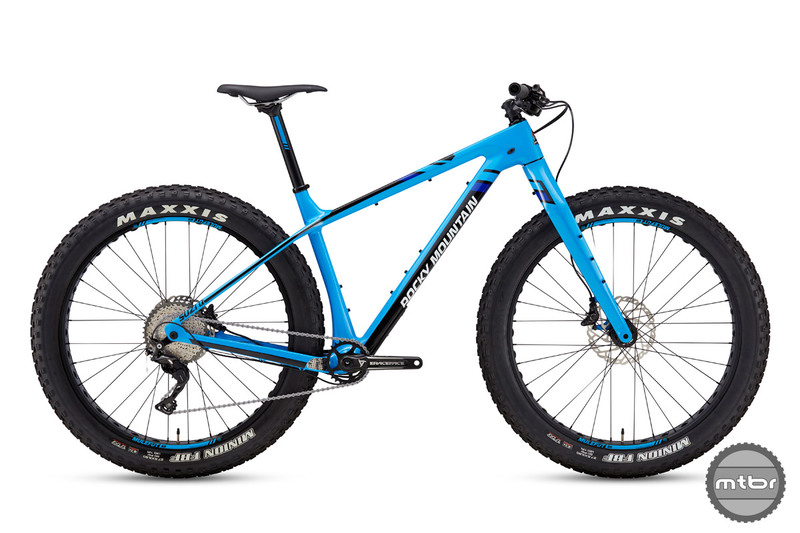 Prices start at just under $2000 for a full aluminum build with a SRAM NX drivetrain and Level brakes. For $2,600, you get bumped to carbon fork and a mix of Shimano SLX and XT bits. The Suzi Q is offered in four different build kits, two alloy and two carbon. For $3,300 you get a full carbon build, full XT kit, and some finishing bits from Raceface. Claimed weight on the fanciest build is 25.3 pounds size medium. The top tier built kit will set you back $4,300 and comes with XTR stoppers and drivetrain (paired with the wider range 11-46T XT cassette). It also includes a carbon handlebar and seat post, and titanium railed saddle. Claimed weight is 25.3 pounds. For more info, visit www.bikes.com. 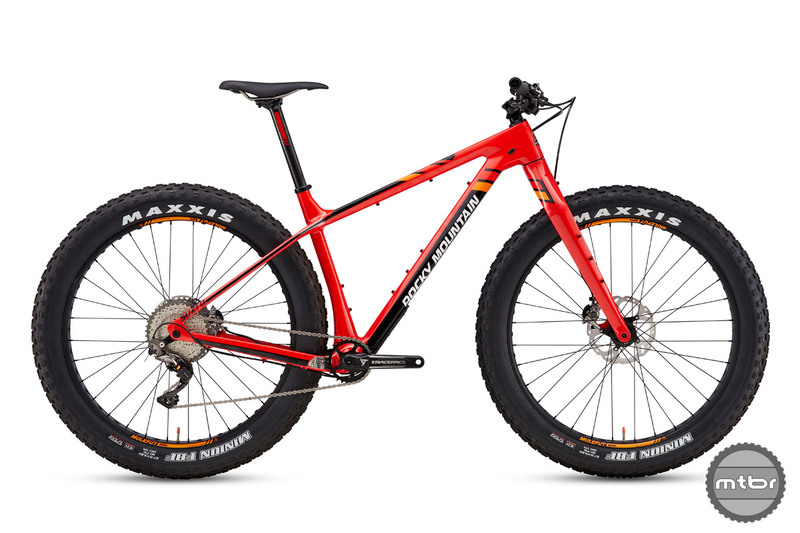 The Suzie Q is compatible with a suspension fork. A 100mm travel Rockshox Bluto set at 20% delivers the same geometry as the stock rigid fork. A narrower q-factor and faster wheels make the Suzi Q more versatile than traditional fat models. There are mounting options for up to four water bottle cages. Two on the fork, plus two in the front triangle. Claimed weight on the fanciest build is 25.3 lb. The Suzi Q is offered in four different build kits. Two alloy, two carbon.